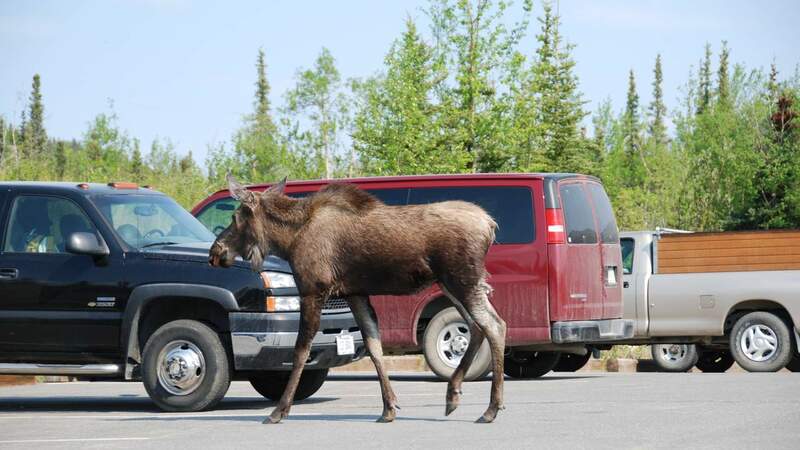 Wilde en ongerepte natuur en uitgestrekte highways omringd door niets anders dan pure wildernis: dat is de Yukon. 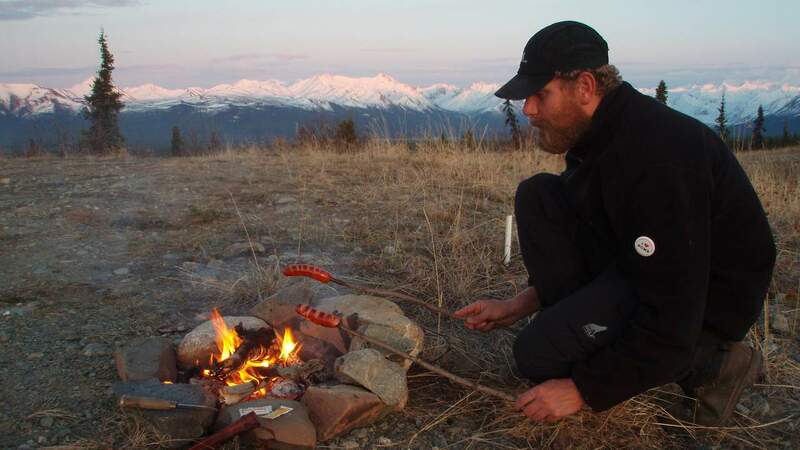 U verblijft hier op de mooiste plekken en combineert dit met een verblijf in het ruige Alaska. 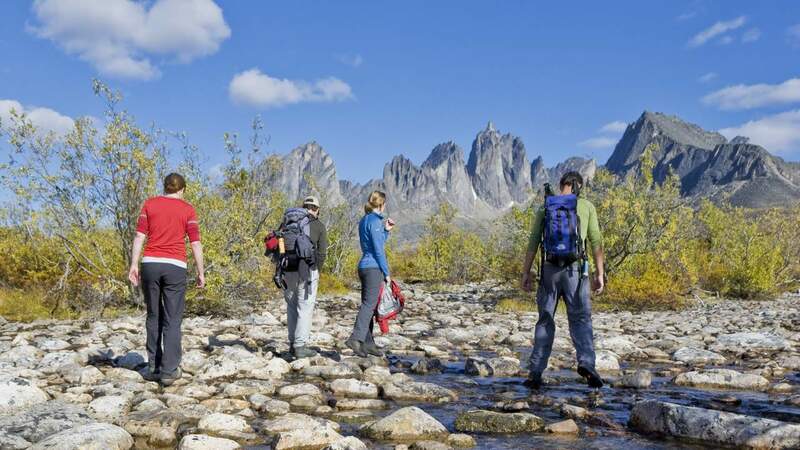 Er worden wandelingen gemaakt op de mooiste plekken en we bezoeken unieke locaties zoals de Tombstone Mountains. We reizen in een klein internationaal gezelschap en kamperen in tenten. De ideale groepsreis voor iedereen die op een actieve manier kennis wil maken met de eenzaamheid en imposante natuur van de Yukon en Alaska. Arrival in Whitehorse, airport transfer, meeting of group members, overnight in hotel. After breakfast you have the opportunity to discover the famous capital of the Yukon, and your stops should include the MS Klondike, one of the last Yukon sternwheelers still around and a visit to the McBride Museum. Start of the grand voyages is early afternoon, and our van will set track towards Skagway. 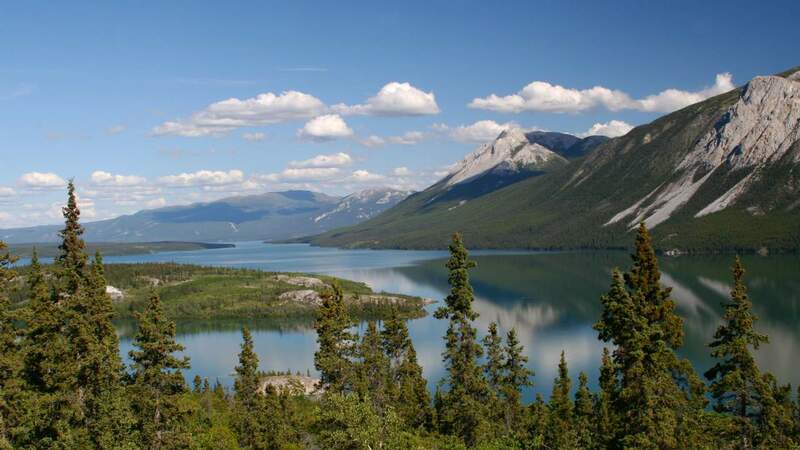 During this trip we will stop at the smallest desert in the world - the Carcross desert - and we will of course also admire Emerald Lake, called "Rainbow Lake" from the locals due to its sensational coloration. Skagway, a hundred years ago the base camp for all Chilkoot Pass travelers is still a historic gold rush town. Many well preserved relics bear witness to its colourful past, including the head of the notorious Chilkoot Trail. In the evening one can relax and get a taste of the gold rush atmosphere in one of the historic bars, for example the "Red Onion Saloon" once a brothel. Via ferry we travel through the Lynn Fjord and with some luck we can see seals, whales, bald eagles and the giant Alaska brown bears, making this area their home. Haines is known as an important centre of the native Tlingit culture and one can watch Totem pole carvers at work as well as visit the local theatre where ceremonial Indian dances are shown. We are following the Chilkat River where during fall salmon migration thousands of majestic bald eagles concentrate. After the Chilkat Pass we can view Million Dollar Falls in a pristine landscape along the Tatshenshini River. 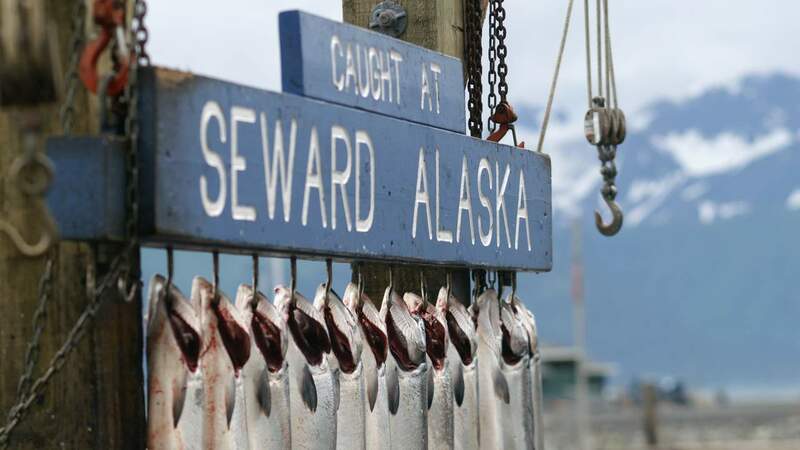 Before we arrive at Haines Junction we stop at Klukshu Village, where Indian people still catch salmon in a traditional manner during their upstream migration. Haines Junction, the gateway to Kluane National Park. We are setting up our base camp on the shores of the deep, blue Kluane Lake and explore the immense scenery of the Park during the next days. 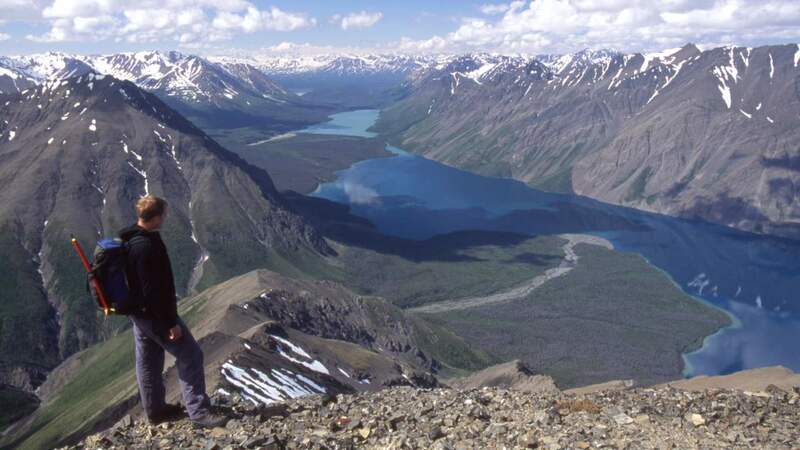 A hiking trip into one of the park's high alpine valleys may give us the chance to spot wildlife such as dall sheep, moose, caribou and grizzly bear. Depending on the level of interest among the passengers we can also organize a spectacular flight by helicopter over the immense glaciers of the park (optional). This adventure, over a virtually pristine wilderness, is especially spectacular during a clear day. With Haines Junction as a base one has a variety of options: what do you think of a tumultuous rafting tour down the world famous Tatshenshini River? This area is simply an adventure wonderland. After leaving Haines Junction we drive besides the shores of scenic Kluane Lake. Mount Wallace, better known as Sheep Mountain is our first stop. 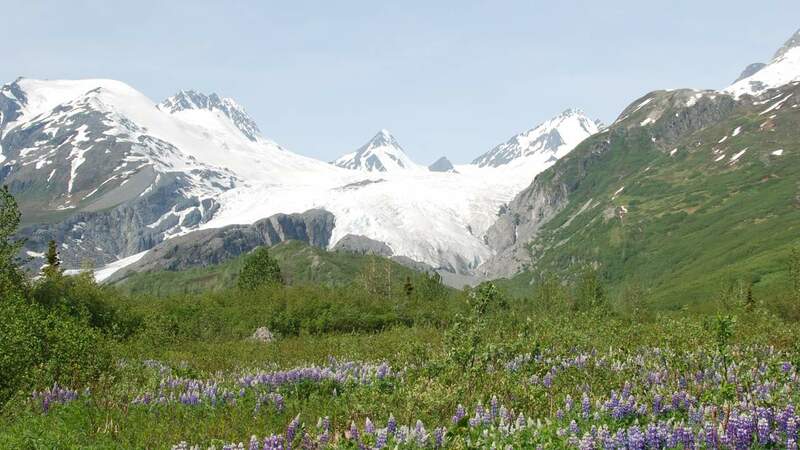 Here, you will be able to spot the rare white dall sheep, and if you did not luck yesterday you have the possibility of joining a glacier flight in Burwash Landing. We cross the Alaska border in Beaver Creek and travel towards Tok, home of one of the best breed of husky dogs. An early start via the Glen Highway and through the impressive scenery of the Wrangell Mountains will lead us deeper into Alaska. The Richardson Highway connects with the Pacific Ocean and the little harbour town Valdez is embedded into the beautiful coastal range. High water falls, roughed scenery and magnificent peaks have given this region the name "little Switzerland", and the Trans Alaska Pipeline ends here. Today you’ll travel by ferry goes through the stunning Prince William Sound; undoubtedly one of the scenic highlights of Alaska. The route runs close to the Pacific coast, passing several calving glaciers in College Fjord. The massive Columbia Glacier is one of the most spectacular on the route. There are also excellent opportunities for wildlife viewing. With a little luck you’ll see otters, harbour seals, sea lions or even whales! Back on land we’ll visit one of Alaska’s “drive-up” glaciers near Portage Glaciers before continuing south along Kenai Peninsula. 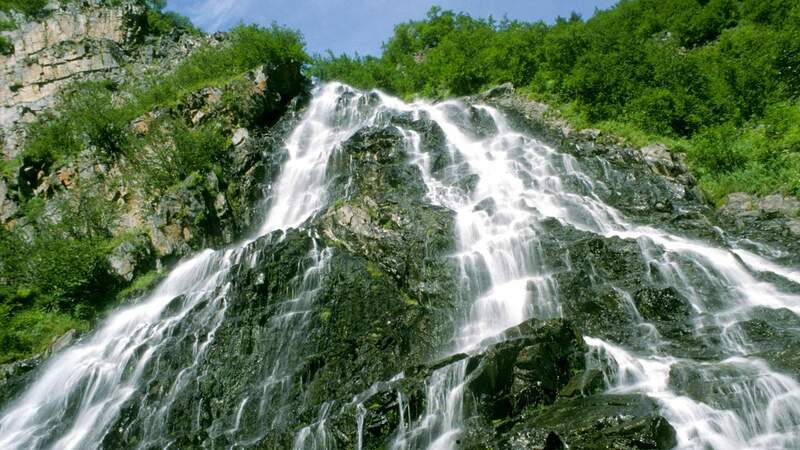 Cascading waterfalls, steep, snow-covered mountains and beautiful pine forests are found around every corner. Today we’ll plan a hike in the Seward area. 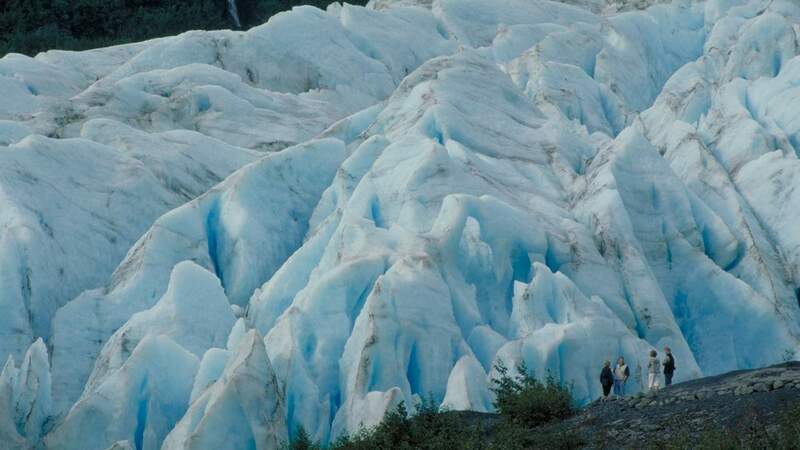 The Exit Glacier is one of our favourite hiking locations in the beautiful area around Seward. We also have some attractive optional tours to chose from including a 6 hour marine life viewing cruise in Kenai Fjords National Park. The all-marine national park is teeming with wildlife including seals, sea lions, sea otters, as well as orca (killer) and humpback whales. Seabirds abound, including bald eagles, kittiwakes and the loveable puffins. Moose and black bears are often spotted along the shorelines. A tour highlight is the tidewater Bear Glacier; the calving ice sending up huge waves as the ancient ice crashing into the ocean. Also well worth the visit is the Alaska SeaLife Center, a salt water aquarium, that is home to sea lions, sea otters and puffins. Today the journey takes us back along the Kenai Peninsula to the scenic Turnagain Arm, named after one of his many failed attempts to find the Northwest Passage. Keep an eye open for the white beluga whales, which can often be seen here frolicking in the shallow waters! The afternoon is free for optional sighseeing and touring in Anchorage, the largest city in Alaska. There are many interesting things to discover including Lake Hood, which is home to the largest float plane base in the world. Each day, some 800 floatplanes take off and land from this location in central Anchorage! Nearby is the Aviation Museum, where many legendary bush aircraft are on display. Downtown Anchorage offers excellent souvenir shopping at several American-style “malls”. Or if shopping is not your idea of a fun activity on holiday, how about a visit to one of the many pubs and locally crafted “micro” breweries?! Northbound via George Parks Highway towards Denali National Park, through incredible landscape. We overnight on a campground near the park entrance. The next highlight of the tour is a visit to Denali National Park with mighty Mt. 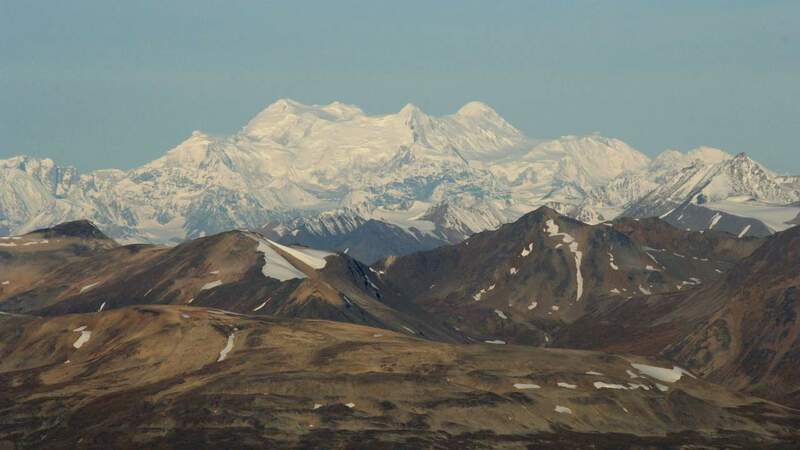 McKinley, the highest peak in North America. We spend two days in and around the park and with some luck we will see dall sheep, moose, caribou and grizzly bears. We are again on the George Parks Highway and the compass needle is pointed northward. Nenana and the Alaska Railroad Museum is another point of interest en route towards Fairbanks, less than 200 km south of the polar circle. Fairbanks invites you to visit the dog mush museum or the many restaurants specialized in Alaska King Crabs... a true delicacy. Another possibility is to join the tour on a sternwheeler on the Chena River. Or choose the visit of þCrown of Light‹, a slide show about the northern lights. We have reached our most northerly point of this exciting journey and we cross the Tanana River directly abeam the Trans Alaska Pipeline. We also reach mile zero of the Alaska Highway in Delta Junction and we will stop in North Pole, the hometown of Santa Claus. Here it seems to be Christmas year round. We travel via the Top of the World Highway back towards Canada, right through Sub-arctic Mountain tundra, above timberline. Today we pass the most northern US-boarder at Little Gold Creek and small historic towns like Chicken, Action Jackson or Jack Wade Camp. Early afternoon we reach the Yukon River and set up camp next to the shores. 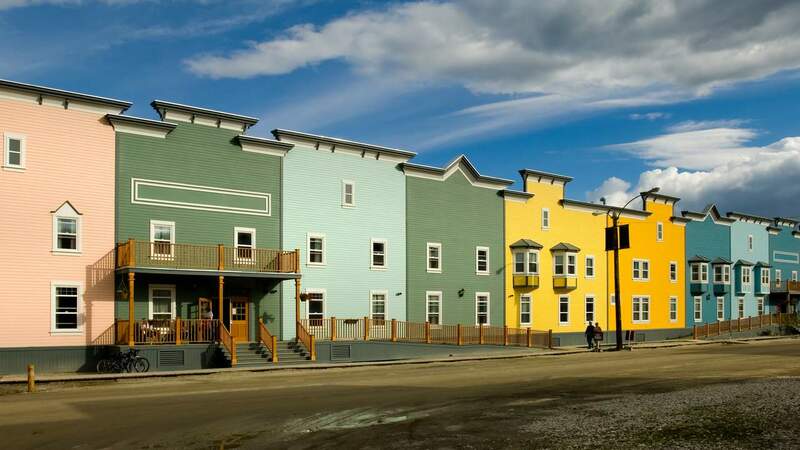 We cross the Yukon River by ferry and start to discover Dawson, the historic gold town and home of many legends. A visit to the Jack London and Robert Service cabins and the gold rush museum are on the program. A highlight is the drive into the Bonanza and Eldorado Creeks where we visit an active gold mine. Later we will drive up the „Midnight Dome“, the mountain overlooking Dawson. We can stroll through the quaint little town where so many buildings from the gold rush era are preserved. In the evening we watch Can-Can girls in the casino „Diamond Tooth Gerties“. Further recommended is a visit to the Palace Grand Theatre with its musical about the gold rush period. We are leaving the fields of the Klondike today and will set up camp near the world famous Dempster Highway. 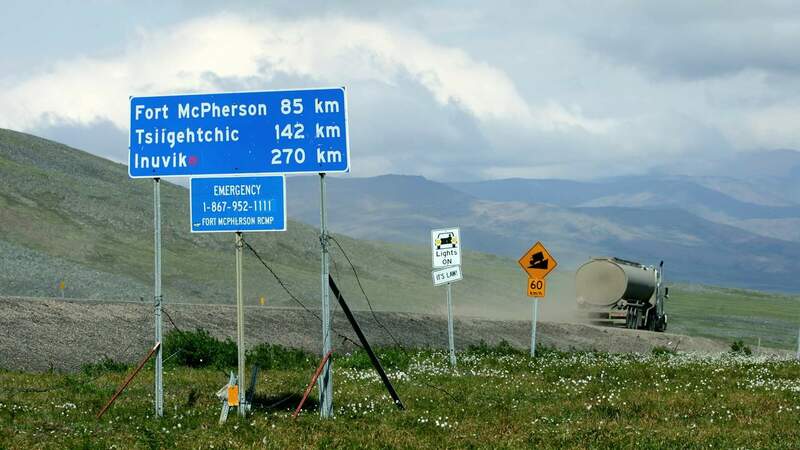 730 KM of gravel road linking the interior of Yukon Territory with Inuvik at the delta of the huge Mackenzie River in Northwest Territories. As we reach Engineer Creek Campground, the huge mass of Sapper Hill, with its castle-like cliffs of dolomite, gains prominence. After we explored the fazinating scenery of the Dempster Highway we will make our way back to the Tombstone Mountains. We camp at a delightful campground at the base of Tombstone Mountain. 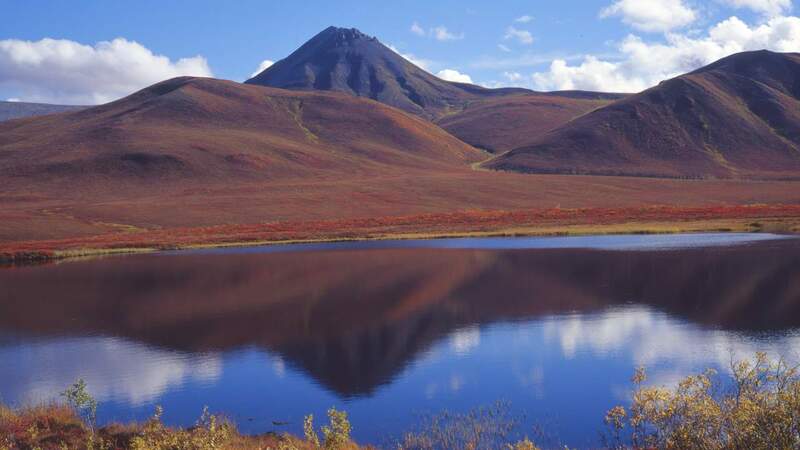 We do some spectacular hiking in this remarkable landscape of tundra and mountains. 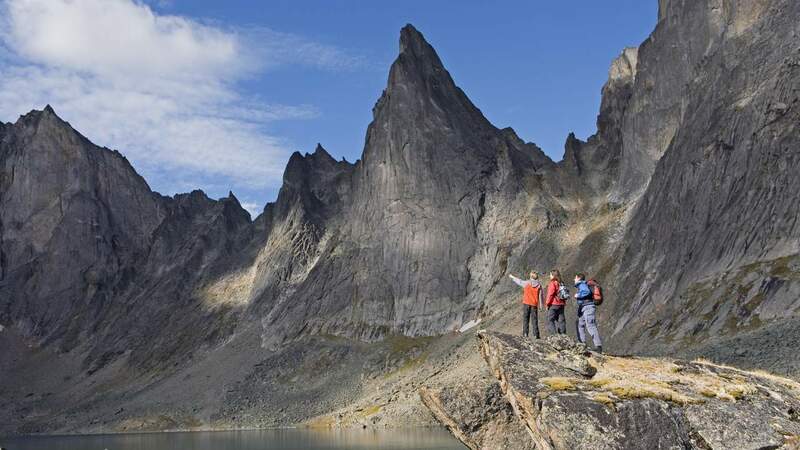 The Tombstone Mountains` unique moon landscape has proved early travelers in this region with an unmistakable landmark. Today we spend the last evening around the campfire and in tents. 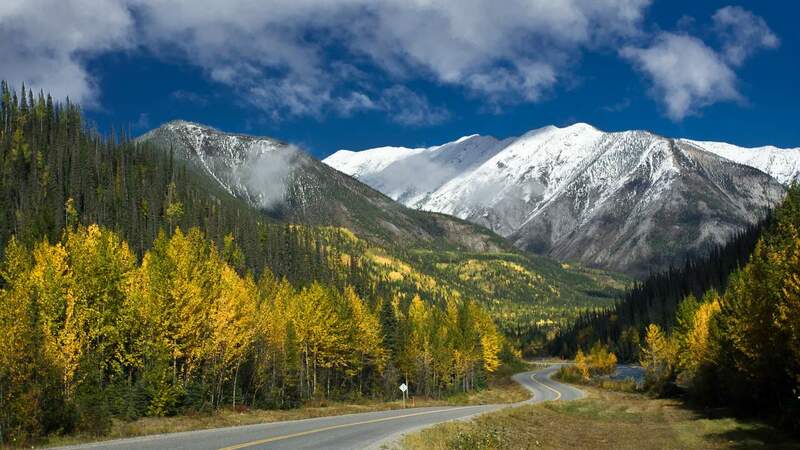 Via the Klondike Highway we return to Whitehorse, following the mighty Yukon River basin. The Yukon River, over 3500 KM in length is one of the worlds longest water highways. The historic journey of the sternwheelers was only interrupted by the dangerous and infamous Five Finger Rapids - another stop of interest for us. Many relicts like old cabins, abandoned post stations and small settlements help us to relive the gold rush times. Hotel overnight in Whitehorse. Transfer to airport or connecting program.